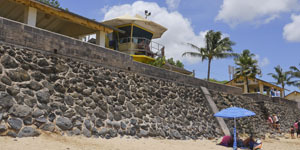 Hookipa Beach is located just north of Paia. This is one of the best wind surfing beaches in the world. Surfing should be left to the professionals as the swells can get dangerous . Swimming and snorkeling on the mostly rocky beach are possible if the water is calm, but conditions and current can change quickly. A lookout located just north of the beach is the best place to view the wind surfers. This is a mecca for surfers and wind surfers where many local and international events are sponsored .